The transmission antenna of the middle-wave radio of height about 50-100m might be seen when running in suburbs by car. Have the structure and the mechanism of this antenna thought how it becomes it? Medium wave (Medium Frequency) There is a round electric wire that is called a capacity ring in the top of the transmission antenna of the radio . (It is said a top crown line in the air. )This increases the earth capacitance of the antenna, shows the resonance frequency of the antenna in the antenna and the transmitter with the coil (extension coil) put in the series, and the antenna can be shown to be long by lowering in equivalence. The performance can be prevented from falling so much even if the main body of the antenna is shortened in a word. There is an effect of increasing the high-frequency current near the antenna tip, and moreover, the capacity ring lowers the launch angle of the electric wave, and has the effect of the flight, strengthening far away, weakening (It is said the Fading fading) of the electric wave, and reducing the electric wave. Generally, it lengthens than the (1/4) wave length electrically, the belly of the current (maximum point) is raised than the ground even a little, and a kind of the earth type antenna that lowers the launch angle of the electric wave though the length of an actual antenna is shorter than the (1/4) wave length. As for the coil, how (top loading and Top Loading) to arrange it is more effective below than it connects it under the antenna of the capacity ring soon. Grounded in the earth beneath the antenna and ground wire grounding electrode (ground radial) is arranged radially from the center called the grounding line. This was done to improve the efficiency of the radio emission. The Earth Radial length (1 / 4) may be close to those wavelengths. (50-100m or more) radio transmitting station is necessary because of the extensive grounds. The first broadcasting---999kHz 100W wavelength is about 300m. The second broadcasting---1359kHz 100W wavelength is about 221m. 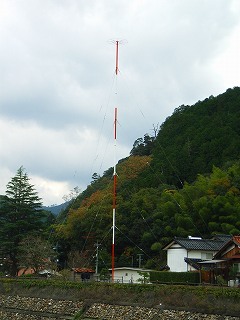 This transmission antenna of the medium wave radio broadcasting is located in the opposite side of Mori-Ogai's old house. Pillars painted red, white antenna is oriented. In order to get on the radio that the state is supporting the body from falling as many stations stretched, to prevent the waves resonate with a shorter length of stay for isolated places to put the insulator I. Transmission power of the transmitting station here is not too large, generally very large medium wave radio transmission power of about 10kW is not uncommon. A large transmission power, in the vicinity of the transmitting station may be a variety of strange symptoms appear. I did not have flash or fluorescent lamp is turned on for example, there is a rare phenomenon or hear the radio from somewhere nearby, but no radio. The frequency of the transmission electric wave becomes, 1MHz(1,000kHz) and wavelength become 300m, and the length of the antenna of the (1/4) wave length becomes 75m. In view of the surrounding architecture, the height of this actual antenna seems about 50m.